Uwingu will launch a radio transmission to Mars on Friday, November 28th, sending almost 90,000 names, messages, and pictures from people on Earth. This is the first time messages from people on Earth have been transmitted to Mars by radio. The transmission, part of Uwingu’s “Beam Me to Mars” project, celebrates the 50th anniversary of the 28 November 1964 launch of NASA’s Mariner 4 mission—the first successful mission to explore Mars. The transmission will begin just after 3 pm Eastern Time in the US on Friday November 28th, and will be repeated twice. 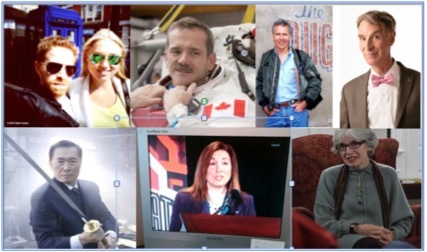 Celebrities like Seth Green, George Takei, Chris Hadfield, and Bill Nye joined in Uwingu’s “Beam Me to Mars” project. Uwingu’s ‘Beam Me’ transmission will be sent to Mars at a rate of 1 million bits per second on November 28th by Universal Space Network. The messages will travel there at the speed of light—arriving at Mars just 15 minutes after they are sent. Copies of all the messages will also be delivered to NASA Headquarters and Congress—both in Washington, D.C., as well as to the United Nations in New York City. Like all Uwingu projects, proceeds from Beam Me to Mars contribute to The Uwingu Fund for space research and education grants. Uwingu founder and CEO, Dr. Alan Stern is available for interviews about the project this week. Contact him via stern@uwingu.com.